It’s the most advanced, natural pain relief available. Multi Radiance Medical laser therapy is completely safe but you must follow the manufacturer’s instructions and be aware of all contraindications. Read the device operating and protocol manuals before usage. Multi Radiance Medical devices have an FDA Clearance and CE certification, a mark of European safety and legal compliance. The effects of laser therapy are photochemical. Photons enter the tissue and are absorbed in the cell’s mitochondria and at the cell membrane by chromophores. These chromophores are photosensitizers that generate reactive oxygen species following irradiation thereby influencing cellular redox states and the mitochondrial respiratory chain. Within the mitochondria, the photonic energy is converted to electromagnetic energy in the form of molecular bonds in ATP (Adenosine Triphosphate). In order to interact with the living cell, laser light has to be absorbed by intracellular chromophores. Cell membrane permeability increases, which causes physiological changes to occur. These physiological changes affect macrophages, fibroblasts, endothelial cells, mast cells, bradykinin and nerve conduction rates. The clinical and physiological effects are obtained by the way in which tissues absorb laser radiation. This tissue absorption depends on the wavelength of the beam itself and the power to ensure that the laser energy reaches the target tissue at the necessary clinical levels. The improper wavelength of laser light would not penetrate into the tissue to reach the target area. Furthermore, even if one has a laser with the proper wavelength, if the device does not have enough power to drive the energy into the tissue, the target area may not realize the potential benefits. Each type of laser emits light at a very specific wavelength which interacts with the irradiated tissue. It also acts in particular with the chromophores present in the tissue, but in a different way. A chromophore, intrinsic or extrinsic, is any substance, colored or clear, which is able to absorb radiation. Among the endogenous chromophores are water and hemoglobin, nucleic acid and proteins. Among the exogenic chromophores are porphyrins and hematoporphyrins, which are injected into the organism. These are described as photosensitizers because they fix themselves to the tissue making it photosensitive at specific wavelengths. In general, laser diodes are either continuous wave or pulsed. The continuous wave (CW) diodes emit laser energy continuously, hence its name. Pulsed diodes emit a radiation impulse with a high amplitude (intensity) and duration which is typically extremely short: 100-200 nanoseconds. Continuous wave lasers produce a fixed level of power during emission. Although lacking the high peak power of a “true” or “super” pulsed laser, most continuous wave lasers can be made to flash a number of times per second to simulate pulse-like rhythms by interrupting the flow of light rapidly as in turning a light switch “off” and “on”. “True” or “super” pulsed lasers, as the name implies, produce a brief high power level light impulse. It is the high power level achieved during each pulse that drives the light energy to the target tissue. Even though the pulse peaks at a high power level there are no deleterious thermal effects in the tissue because the pulses are of such short duration. Therefore, the peak power of a “true” or “super” pulsed laser is quite high compared to its average pulse power. By using “true” or “super” pulsed lasers, one is able to more effectively drive light energy into tissue. The laser and electronic technologies required to use pulsed diodes are more advanced and the diodes themselves are more expensive than the continuous wave diodes. This is why over 90% of the therapeutic lasers in the North American market are low power continuous wave lasers. Some of these lasers provide power literally at the same level as an inexpensive laser pointer costing around $30. The industry’s technology leader, Multi Radiance Medical’s LaserStimTM is the first FDA cleared device that combines laser-light and electrical stimulation in one probe, allowing for a third party reimbursement. Engineered by the world’s top space scientists and radio engineers, Multi Radiance Medical develops and produces the industry’s most advanced medical therapeutic devices which use low dosage electro-magnetic radiation, integrating pulsed laser, visible red and infrared lights and magnetic field. SOLON, Ohio (April 28, 2011) – Getting back on the field quicker and healthier is what sports injury rehabilitation is all about. Leading major sports athletic trainers credit new benefits made possible with laser therapy equipment by Multi Radiance Medical with getting players back in action sooner. 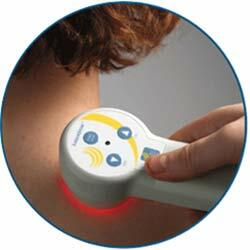 Multi Radiance Medical develops and manufactures the most advanced laser therapy equipment on the market. The company’s MR4TM laser uses Low Level Laser Therapy (LLLT) to treat inflammation, provide deep tissue therapy and accelerate pain relief to help athletes minimize down time. It is the first laser therapy equipment to combine the entire therapeutic light spectrum into a single technology. Chris Kingsley, head athletic trainer of the Los Angeles Kings, uses the MR4 laser as part of the team’s daily treatment. “The MR4 provides unparalleled pain relief for acute and chronic conditions, and helps restore mobility and range of motion for faster post-injury recovery,” said Kingsley. Multi Radiance Medical also provides portable laser therapy equipment for treating injuries during play. The MR4 ACTIVTMlaser delivers 15,000 mW of super pulsed laser power and lasts up to 18 hours on a single charge. The unit is used by more than half of the National Hockey League’s teams. Multi Radiance Medical develops and manufactures FDA-cleared laser therapy equipment using super pulsed laser therapy, integrating pulsed laser, visible red and infrared lights and magnetic field to treat acute/chronic pain, back pain, arthritis pain, tennis elbow, muscle strain, tendonitis, and other conditions. Its LaserStimTM is the first FDA-cleared device to combine laser light and electrical stimulation. 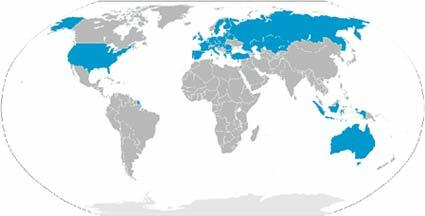 Multi Radiance Medical has served the market for 20 years and is in more than 30 countries. For the first time in their 45 year history, the L. A. Kings are Stanley Cup Champions! We celebrate and congratulate them for the talent, drive and stamina necessary to go through a full NHL season and then win a SECOND season in the playoffs! The L.A. Kings faced the toughest competition that the league had to offer and competed in the Stanley Cup playoffs in a manner not seen in sometime. We at Multi Radiance Medical salute the “Best of the Best” in the NHL in 2012! 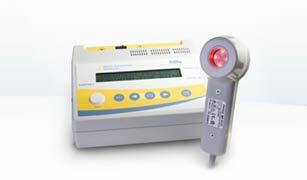 “Multi Radiance Medical’s MR4 Laser Therapy device provides unparalleled pain relief for acute and chronic conditions. It also helps restore mobility and range of motion, which allows for faster post-injury recovery during an intense season.” Chris Kingsley, Head Athletic Trainer, L. A. Kings. Questions? Concerns? 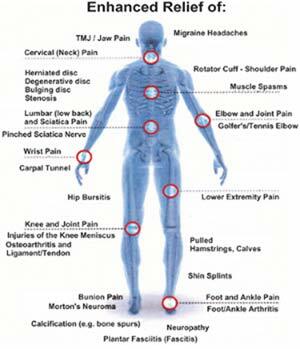 Give our Saginaw chiropractic office a call and put your mind at ease.